Preheat oven to 450°F with cast iron skillet inside. Being careful not to burn yourself, remove the skillet from the oven and toss in the butter. Tilt the skillet so the butter coats the bottom and sides. Pour the chocolate chips evenly into the skillet. Again, be careful not to burn yourself as you arrange the marshmallow halves over the chocolate chips. Be sure to cover the chocolate completely. Bake for 5 to 7 minutes or until marshmallows are toasted. Watch it carefully because the marshmallows can quickly burn. Remove the skillet from the oven and allow to rest for 3-5 minutes. Don’t skip the resting time. The chocolate is also still melting during this time. 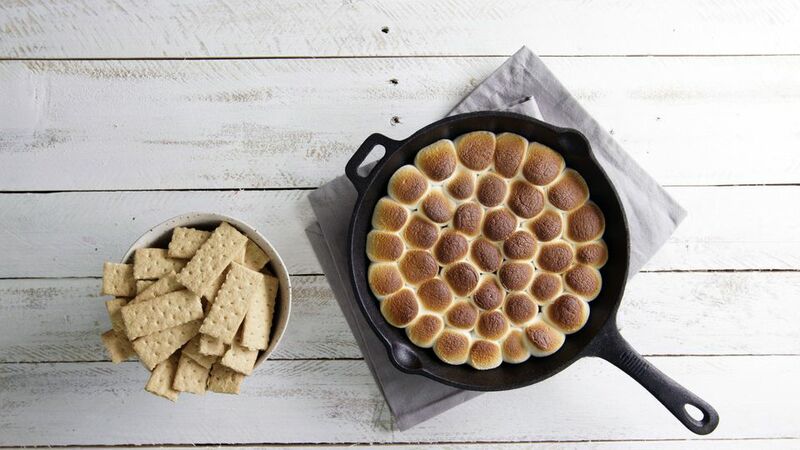 Serve warm with with graham crackers for dipping.